I’ll be honest with you; I love Hellboy something fierce. Of all the comics I have, it’s one of the few that I come back to again and again. The bindings on my trade paperbacks are worn. Pages are falling out. I read it for the art just as much as I read it for the story. 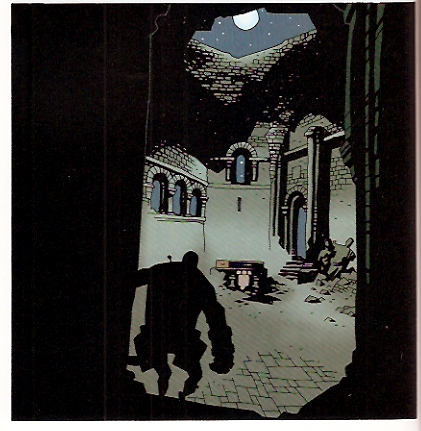 Mike Mignola has a great design sense. The page layouts are always carefully considered. 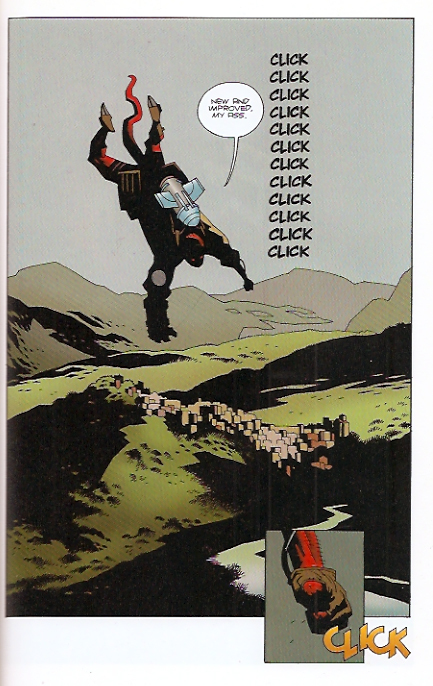 One of the things that Mignola does that completely blows me away, though, is how he can imply complexity with the simplest of shapes. 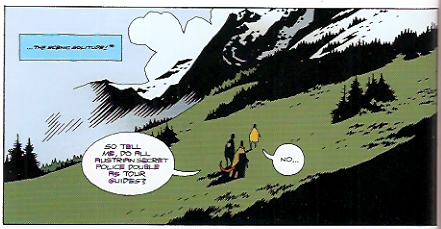 In the above panel, we can see Hellboy at a great distance. So little is shown of him, but just his red tail is enough to tell us it’s Hellboy. The mountains are disappearing into the sky. With just a few lines, we get a feeling of deep grass and small trees. 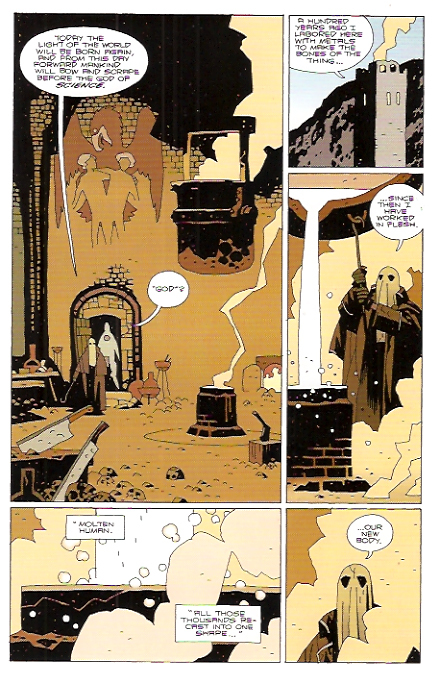 Mignola gives us a framework to fill in with our imaginations. You can see the same ideas at work in the above page. The first panel, those little bumps on the floor imply rubble that is not shown. The bricks imply that it is all bricked, but we can easily fill in the rest. The forms of the bowls & flasks near the door are really simplified, but still enough to know what’s there. As the figure comes closer, the details get filled in a bit. And again, below. You can see the details around the edge of the image. The rest of the details are implied by the details that are there. And again! Look at that city! We can imagine all the windows there. We can imagine the bricks, the stone. We can imagine the details on the background mountains, in the grass. But he doesn’t need to show us. He took out what was unnecessary and left the rest for us to fill in. Going back to my previous post about design, I talked a bit about using design to evoke a response in the viewer. Using some details to imply further complexity is just that. It is an exercise in restraint, in removing the unnecessary. He knows that we will fill it in. He knows how much he can take out and still make it make sense. And maybe even more astoundingly, he knows where to take it out. Look again at the 2nd and 3rd images. Notice that the detail is around the edges of the panels and that the center is left somewhat barren. This serves two purposes. 1) The lighter tone of the centers draws our eyes in (think of the black details as acting as a darkening/graying agent). 2) By removing unnecessary details in the center, the objects that are shown there stand out with greater clarity and importance. The two figures entering the door are more clearly seen as being drawn towards that black smoking object in the foreground. The altar in the 3rd image has a greater significance. It is pulling Hellboy towards it the same way our eye is drawn to it. This is design, folks! It is a seemingly simple trick, removing details to provide a greater overall clarity while leaving in the necessary details to imply a greater complexity. Mignola does this so well that it can easily be overlooked, overshadowed perhaps by his expert use of solid blacks on the page. He uses this device to declutter his compositions, to provide greater page flow. But when you think about it, it really is pretty incredible that he can imply so much with so little. so true. and those bricks… i’ve never been able to get that right. showing just enough of the brick pattern to let the viewer know the whole thing is brick, but not actually outlining every brick.